Preparing to engage an opponent, Carter looks for an opportunity to shoot. Carter was named varsity wrestler of the week and boasts a 6-2 record. “When you get out on that mat and you’re really in that fight or flight moment, you know you have to win,” Carter said. Then, Carter’s matter-of-fact tone becomes blended with melancholy. “I’ve had some pretty hurtful things said to me as well. I remember we were at Ladue and this guy, we went hand in hand and he beat me, and he said, ‘you only lost because you were a girl.’ That really got to me,” Carter said. She pauses, reflecting on her rise from the receiving end of diminutive treatment to being a trailblazer for the next generation of female wrestlers. Carter does not hesitate now, her answer is blunt. This is not the first time she has been asked this question. Carter is short-spoken. 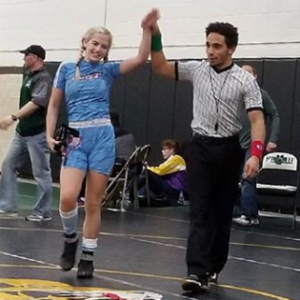 Determined to establish herself as a leading presence in the inaugural season of officially-sanctioned Missouri girls’ wrestling, Carter strives to no longer be seen as a female wrestler, but simply a wrestler—and a serious contender going into the district tournament Feb. 1-2. “Fingers crossed, knock on wood that I make it to [the] state [competition] because that’s all I really want,” Carter said. 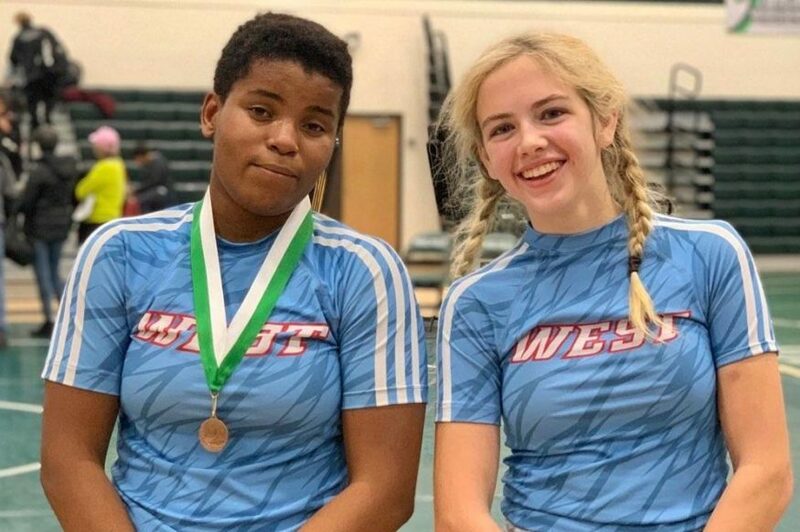 Currently ranked fourth in Missouri in the 167-pound weight class, Carter has her sights set high, and she has the hardware to back it up with third place medals at both the Mehlville Women’s Invitational and Lafayette’s Fred Ross Invitational. 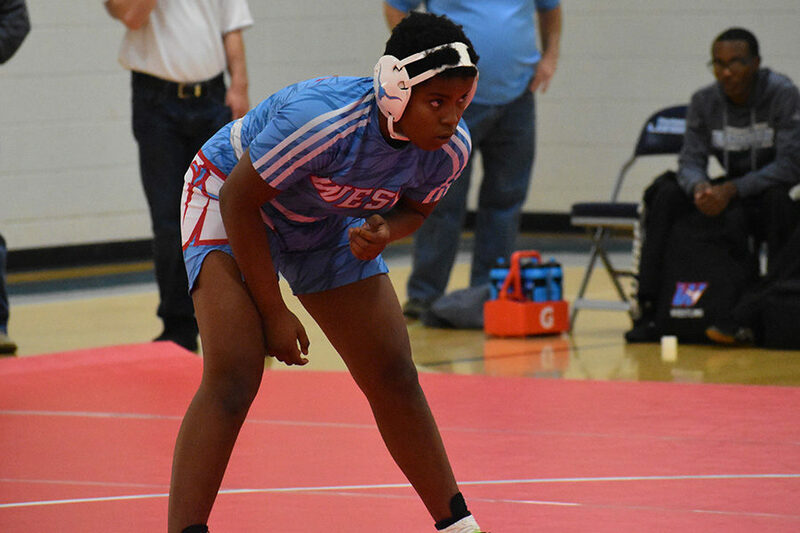 Some of her biggest motivating factors are the girls she mentors and works with through Junior Patriots wrestling. Carter was first brought into the sport through Junior Patriots by middle school physical education teacher Drew Lilledahl, and now she volunteers her time helping the next generation of wrestlers. “I try to be [a role model], I really do, because nothing makes me happier than seeing girls in a sport that’s full of boys, and then beating the guys,” Carter said. She pauses once more, collecting her thoughts and returning her focus to the opportunity of the girls state championship lying just ahead of her, to the district tournament tonight and all the discouragement she overcame to get here. Freshman Paige Wehrmeister had not always seen herself as a strong person—then she started wrestling. Joining sophomore Emma Carter as one of two female wrestlers in Parkway, Wehrmeister has already carved out a reputation for herself: the girl who smiles every time she steps onto the mat. Wrestling on the varsity lineup at 120 pounds, Wehrmeister has an 8-8 record between her matches against both boys and girls. 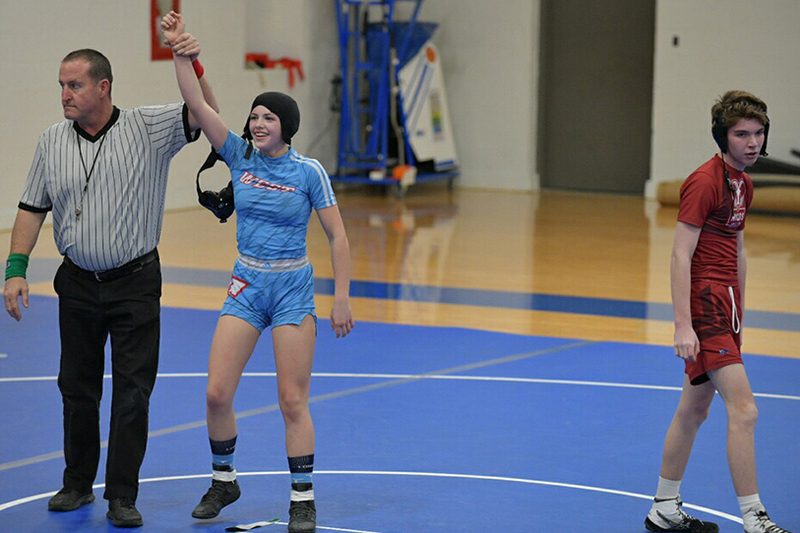 With seven of her eight wins being pins, holding her opponent’s shoulder blades to the mat for two full seconds, Wehrmeister is quickly learning the skills it takes to succeed against a diverse range of opponents. She credits most of this growth to her coaches and the opposing boys she has faced. Wehrmeister has her hand raised after a win at the Mehlville Women’s Tournament Dec. 21. Wehrmeister laughs and collects her thoughts, reflecting on the broad range of experiences she has had this season, from her very first match four weeks into the season to placing fifth at the Mehlville Women’s Invitational Dec. 21. Wehrmeister’s “happy aggression” defines her wrestling style, in her eyes: quick, energetic and persistent. She continues to develop it by treating every match as a learning experience and frequently asking her teammates to try different moves on her so that she can practice reacting. “Girls and guys are so different in wrestling styles and body types. I feel like because I’ve been able to wrestle boys and definitely girls, I’ve been able to learn different styles of wrestling. It’s really helped me a lot because it helps me understand how my body works,” Wehrmeister said. Seeing the representation of different body types in both girls and boys, all weighing the same as her, has helped Wehrmeister increase her self-confidence and self-image. At the start of the season, she was unsure of her body’s abilities—now, she savors every opportunity to go out on the mat and show what she is capable of.